This dazzling 13 x 13 castle moonwalk glitters and sparkles in the sun!! Our Dream Castle Combo has it all! Inside you will find a jumping area, vertical and horizontal pop-ups, a climbing wall with a fast slide. There is even a basketball hoop attached to the outside of the unit. Your own backyard splash Island! 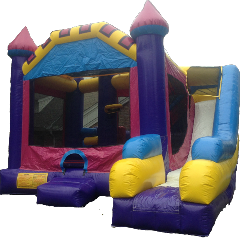 This is a 15ft by 16ft bounce house and includes a basketball hoop inside! 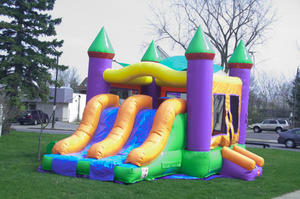 Perfect for the youngest party goers this double lane bounce and slide will keep them jumping for hours! All the little pirates and princesses will love this pirate ship with a bouncing area and slide.